SAINT-QUENTIN-EN-YVELINES, France – Justin Thomas wasn’t your typical Ryder Cup rookie this year. He’s been around this tournament for years, and after an incredible showing at Le Golf National, he’s poised to be around for a long, long time. Thomas, 25, went 3-1 in team play alongside good friend Jordan Spieth, and in a major vote of confidence from Jim Furyk, Thomas was chosen to open Sunday play against European superstar Rory McIlroy. Amid the European chants, McIlroy’s presence and the narrow, winding French golf course, Thomas matched the Irishmen shot-for-shot until the 18th when McIlroy melted down and eventually conceded the hole, giving Thomas and the U.S. the day’s first point. 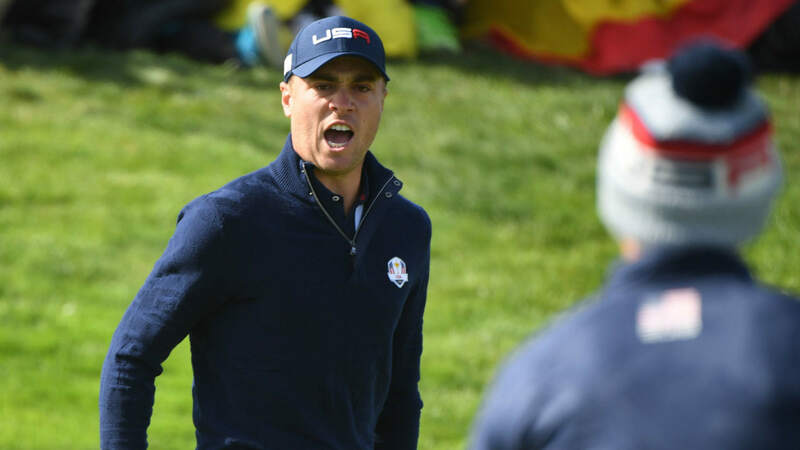 Thomas called the ending with McIlroy “unfitting,” but still felt the magic of Sunday at the Ryder Cup. Justin Thomas defeats Rory McIlroy 1-Up to earn his 4th point of this Ryder Cup. A former world No. 1 and major champion, Thomas has spent his entire life around the game. His father worked for the PGA, and before this weekend, Thomas had attended three Ryder Cups and played in the junior event. As an 15-year-old, Thomas mingled with players behind the scenes at Valhalla in 2008. Now, at age 25, those experiences helped him not be overwhelmed by the setting or stakes of the tournament. Thomas did just that — he controlled what he could and became the star of this year’s team.